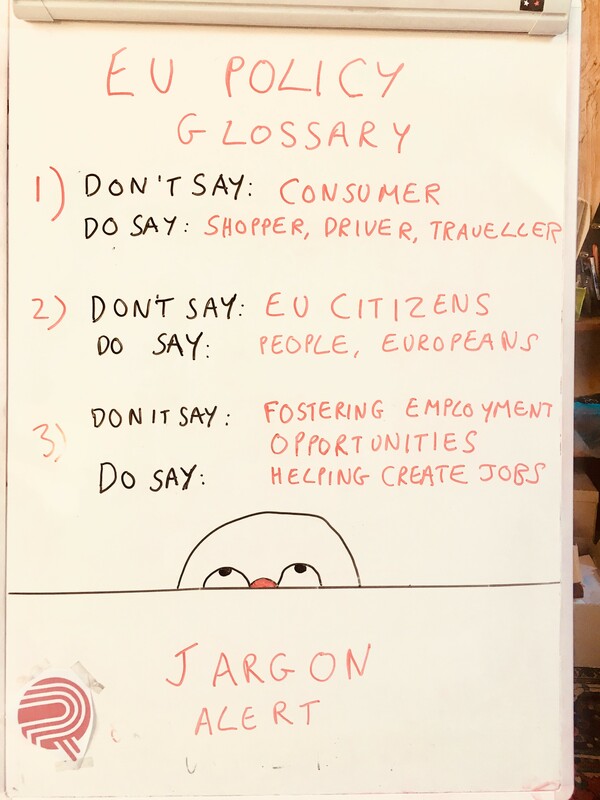 It feels a bit cheap to be complaining about EU policy jargon AGAIN but I do think communications throughout the Brussels bubble would get a massive boost if all spokespeople and organisations stopped talking or writing about ‘EU citizens’ when ‘Europeans’ or – even better – ‘people’ would do. It’s a well-trodden cliché but the guideline for external communication really should be to ask yourself how you would describe a policy that affects phones, food pricing or how to watch films in different countries if you were talking to friend in a bar. If you are someone who naturally describes yourself as ‘an EU citizen who accesses audio-visual content via online platforms’ (instead of a person who likes to watch films & tv shows on the web) then you are beyond help. But everyone else has a duty to colloquialise. This is not a problem of Brussels being made up of non-natives writing and working in English. It’s about a mindset that understands that policy language has its limits, especially in the digital age. I have long been of the view that one reason the EU is in so much trouble is because it can’t communicate the important work it does in language that connects with ordinary people – you know, like those of the human variety? ‘BRUSSELS IS RUBBISH AND KILLING ALL HOPE OF DECENT PEOPLE FINDING GOOD JOBS’. ‘Through our structured dialogues and cross sectoral analyses we will work to foster employment opportunities for all EU citizens’. This is not to argue in favour of distortions or inaccuracy but simply to point out that one of the reasons why populists connect so well with some parts of the population is because of their plain-speaking style. If de-jargoning is a daunting prospect it might be helpful to start keeping a glossary (if this isn’t already happening). Here are another four concepts I would add. Green transport or clean transport. Then why not sign up to our distribution list at the top of the page?